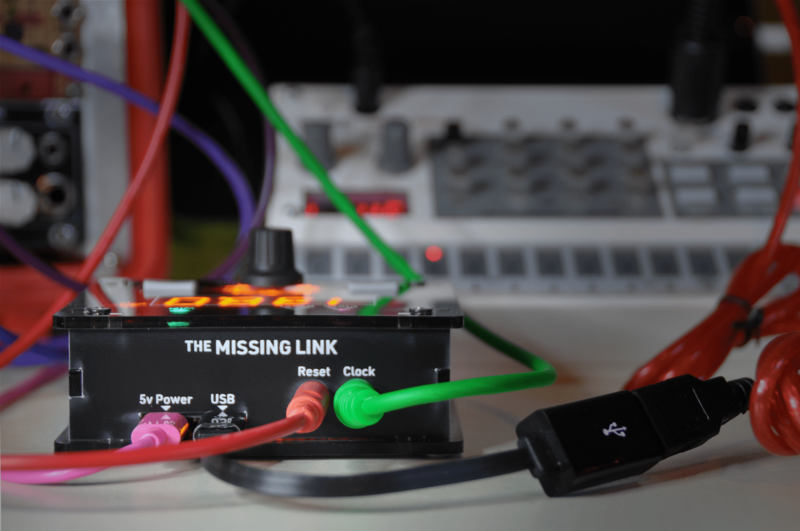 The Missing Link brings Ableton Link to the analog world. Connect The Missing Link’s clock output to your rack of modular synths. Plug in a class-compliant USB MIDI interface and start sending MIDI clock to your drum machines. Now it is effortless to get jamming with iOS music apps and synchronize with DJ and VJ software that support Ableton Link. Buy The Missing Link in Europe! Don’t pay extra to ship to the EU! The Missing Link is now available for purchase at SchneidersLaden in Berlin, Germany. Add a class-compliant USB MIDI interface and start outputting MIDI clock to all of your drum machines and sequencers! Sometimes The Missing Link is a little ahead or behind in time with respect to your other Link devices. Now you can adjust the delay compensation the way you would adjust track delay in Ableton Live or other DAWs. If The Missing Link can’t find a WiFi network to connect to, it will go in to Access Point Mode. Connect directly to The Missing Link via WiFi to configure it to connect to your WiFi network. Now all your Link 3.0-compatible apps can tell The Missing Link to start or stop in sync. Or, The Missing Link can tell your other devices when to start and stop. It’s quite magical to watch. DIN Sync is a clock synchronization standard created before MIDI took over. It’s in a lot of older Roland and Korg gear such as the Roland TR-808 or 909. The Missing Link now supports DIN Sync via an 1/8″ TS to DIN plug adapter. It’s easy to make an adapter if you are handy with a soldering iron. Contact me if you are interested in buying one.